The Oregon Institute of Technology women’s basketball team won when they most needed to and in the process ended Southern Oregon University’s 17 game home winning streak. OIT overcame a 12 point deficit in the second half to complete the 77-74 upset in the Cascade Conference semifinals. The first half of the game saw the Raiders run out to a 27-16 lead, however OIT battled back and had a 1-point (37-36) deficit going into halftime. SOU’s Carly Meister and Courtney West combined for 24 points in the first half, 10 and 14 respectively and Megan Whetstone led the OIT attack with 17 points. OIT shot 43.8% snapping a streak of 9 straight SOU opponents shooting under 36%. Prior to the game, the Raiders last 9 home games were won by an average of 26.1 points. 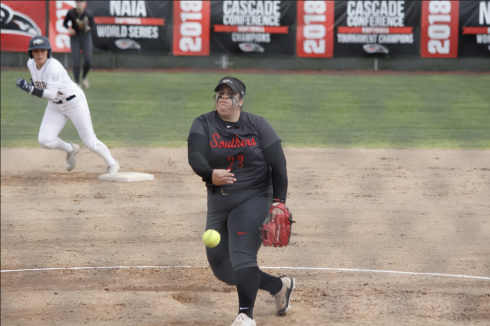 OIT took the game from the Raiders and also beat Eastern Oregon in the conference championship game Monday night to secure an automatic bid to the 32-team NAIA tournament. Regardless of Friday’s loss and OIT winning the conference championship, the Raider women are nearly a lock for an at-large bid to their first NAIA tournament since 2009.